EUR/USD is unchanged in the Tuesday session, after sustaining losses on Monday. Currently, the pair is trading at 1.1278, up 0.02% on the day. It’s another slow day on the data calendar, with no eurozone or German data releases. In the U.S., JOLTS Jobs Openings is expected to slow to 6.84 million. On Wednesday, the eurozone releases industrial production and the U.S. releases CPI reports. European Union finance ministers are meeting in Brussels on Tuesday, and high on the agenda is a proposal for a eurozone budget. Unsurprisingly, the proposal is controversial, as members have sharply diverging views on the subject. France supports a large budget, while fiscal-conscious Germany is in favor a scaled-down budget. The current proposal calls for a budget of 55 billion euros. With the eurozone economy experiencing a slowdown which has affected Germany and other large members, policymakers may be more open to the idea of pooling funds and create a budget in order to strengthen the eurozone and the euro. The euro has been on a six-day slide, losing 1.6% in that time. The catalyst for the downturn has been disappointing data out of the eurozone and Germany. Recent consumer data has been soft, with retail sales and inflation pointing lower. German manufacturing is also in trouble, with factory orders and industrial production recording declines. The global trade war has dampened the appetite for German and eurozone exports, which has weighed on the manufacturing sector. The U.S. poised to impose new tariffs on China on March 2 if a trade deal between the two countries is not reached. Although the sides are talking, there has been little sign of progress. 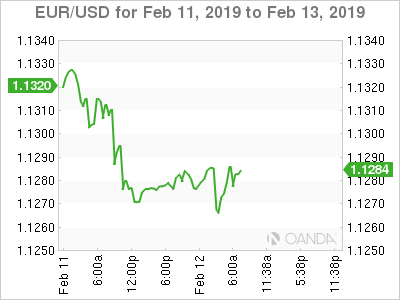 If the tariffs are put in place, investors could send the euro sharply lower.